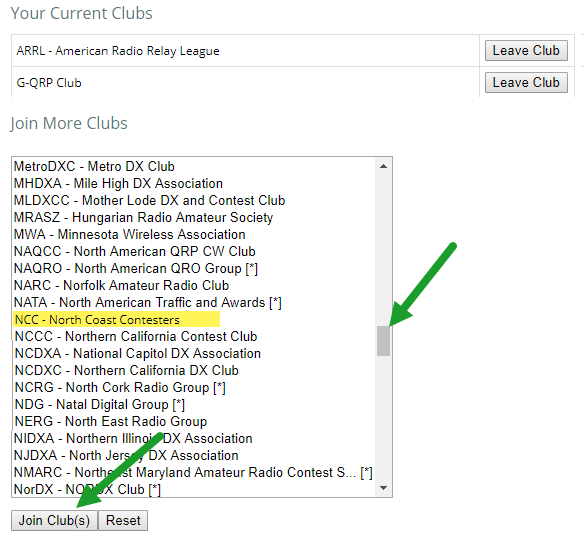 Thanks to the efforts of Anthony, K8ZT, NCC is now a registered club with Club Log. Here is some information provided by Anthony on what Club Log is and what you can do with it. Anthony is now the official administrator of Club Log for NCC, so contact him with questions/assistance. Thanks Anthony! Club Log is a FREE online database with a suite of powerful tools supporting active DXers and Contesters. … and much more. This is just a taste of things to come! If you are interested in Participating you must add yourself to this club. The opt-in principle is how Club Log is intended to work. After you choose to join clubs you will see a “Pending” membership note. Club log will send me an email and K8ZT or ND8L will approve you as a club member. Use the DXCC charts menu option under Your Log to find out which DXCC countries you have worked on each band, and which of those have been confirmed with Logbook of the World confirmations or QSL cards. There are options to filter the QSOs by mode, by current-only or current-plus-deleted DXCC countries, worked/confirmed/wanted, and by years if you wish to be more specific in your analysis. If you upload logs for different callsigns (e.g. your normal and contest calls), you can also choose which log or logs to analyze. Check your league position to see how well you are doing in relation to other DXers who use Club Log. Be prepared for the reports and league tables to be updated – some are updated almost straight away, others may take a day. Club Log’s personal reports will warn you if you have made a significant upload subsequent to the database snapshot used in the reports: that anomaly should resolve itself in due course. Most errors are due to Club Log disagreeing with your logging program about which DXCC countries you have actually worked. This is the power of Club Log’s extensive database of DXCC information and a huge amount of research into DXCC. Almost always, you will discover that you or your logging program has made a mistake with the claimed DXCC country. Correct the country, re-export and re-upload your log to have Club Log check it again. If you don’t want to receive the upload confirmations or errors, you can tell Club Log not to email you its summary after an upload using an option on the Settings page. You don’t need to upload your entire log every time – just export and upload the QSOs you have logged since previous Club Log upload. If your logging program has the option to export just your latest QSOs to an ADIF file for signing and uploading to LoTW (Logbook of The World), you can upload that same ADIF file (not the signed .tq8 file!) to Club Log as well as LoTW. Some logging programs have the facility to upload each QSO automatically to Club Log as you log it – check the logging program’s help for details. Don’t worry if you accidentally upload QSOs more than once – Club Log simply identifies and skips the duplicates unless the QSO details have changed. If you have made lots of changes to your log (e.g. you have received a batch of QSL cards from the bureau and updated the QSL details in your logging program), or if you think your log in Club Log might be incomplete or corrupted, it is a good idea to output your entire log to an ADIF file, upload it to Club Log, and then in Step 3, choose “Clear my existing log first, then upload”. This option deletes your previously uploaded QSOs for that callsign, then imports the newly uploaded ADIF file. It doesn’t hurt to do this every so often – maybe once a year – to be sure that Club Log is working with your complete and accurate log. If you manage the logs for several callsigns (e.g. personal and club calls), you can export and upload the logs one call at a time, in the same way, selecting the relevant call in Step 1, assuming you have configured your Club Log profile for all your calls. You should be careful always to match your uploads to the right callsign, though. K3LR Captures Both CW & SSB N.A. Wins in 2018 CQWWDX Tests! 2018 was a great year in the CQWWDX contests for the K3LR multi-multi station. Tim’s fantastic setup and first-rate ops managed to place first in North America in both the CW and the SSB weekends, a feat that they have not managed since 2014. Based on claimed scores, the West Middlesex, PA ops squeaked past rival W3LPL in the CW competition by a margin of just 341,056 points after being edged out by the same station by 149,479 points in 2017. The claimed scores for the two stations were 19,486,811 for K3LR versus 19,145,755 for W3LPL. In 2017, the scores were 17,248,623 for ‘LPL and 17,099,144 for ‘LR. The margins of victory in both years were less than 2%! In the SSB weekend, Tim’s ops delivered the 14th straight North American victory for K3LR. What an incredible record. The scores were not even close, with K3LR making over 1,000 more contacts than second-place KC1XX in New Hampshire and nearly 1,300 more QSO’s than their Maryland rival W3LPL. It seems that K3LR really owns the CQWW DX SSB contest in North America and can only be beat by stations in Zone 33 and other geographically advantaged locations. Congratulations, Tim! After extensive renovations, Tom Lee’s Chesterfield, Ohio station is finally back up and in the game. Tom and his ops spent much of the summer rebuilding the inside shack to bring the wiring and operating positions up to standards. Unfortunately, the work was not quite complete by the time of the CQWWDX phone weekend, so when Tom’s ops arrived to operate the contest, they were given screwdrivers and wire cutters instead of microphones and headphones. But by the end of the weekend, all six positions were up and running and the station was ready for the CW weekend. This gave Tom’s ops the chance to show what they can do, with the result being over 4,500 contacts in the competitive M/2 HP category for a fourth place finish with 9.1 million points. We expect great things from the refurbished K8AZ station going forward as Tom has some of the best ops in the country! Good participation from CW ops in our two clubs allowed the combined MRRC/ NCC to field four teams with 17 ops in the September 2018 NA Sprint. None of our ops made it into the super-competitive top ten high power list this time, but KW8N, K8MR, K9NW, K3LR and N3RD came very close, and the last four stations did make the top ten 12 or fewer band change list. Our ops did better in the low power standings with N8EA, W8WTS, K3UA and W1NN making it into the top ten. Although his score was left out of the initial results article published in the NCJ, KW8N edged out K8MR to place at the top of the 8th region. Challenging 20 Meter conditions was the main feature of this particular NA Sprint. This was an especially big obstacle for our low power and poor antenna entrants. Only N8EA managed to make over 30 contacts on 20, with W8WTS, W1NN, ND8L, K1LT and K3UA and the other LP entrants making 30 or less contacts there. This was the main reason why the low power scores were lower than usual this time and is far below normal. 28 teams participated this time. Our best team (KW8N, K8MR, W8WTS and W1NN) managed an 8th place showing with only four scores. One more decent score would have pushed this team up at least three or four places. Our other teams placed 12th, 13th, and 19th. The full results of this and other Sprints can be found in the NCJ and on the NCJ website. The next NA Sprint CW is scheduled for Saturday, February 2 at 2000 EST (February 3 at 0000Z). Conditions were excellent for the August, 2018 North American QSO Party CW and the scores submitted by the participants clearly reflected this fact. Winner AA3B managed over 1,300 contacts and 221 mults to produce a score of 287,742 points. As this is just a 10 hour contest, AA3B averaged 130 Q’s an hour! This high level of activity is the major reason why these twice-yearly contests have become so popular. The North Coast Contesters and their friends from the neighboring Mad River Contest Club managed to collect 24 ops to put together six teams to compete with the other 90-some teams from around the country and Canada. Our NCC/MRRC Team 1, consisting of NA8V, K1LT, W8CAR, K3UA and K8GT managed an 8th place finish against really fierce competition from teams from the Northern California Contest Club, the Contest Club Ontario and the Society of Midwest Contesters. Other NCC/MRRC teams placed 23rd, 31st, 49th, 66th and 82nd. Nice job, guys. Again leading the pack with the top score was Michigan-based NA8V, who managed 973 contacts and 195 mults. W1NN produced the second highest score for the club with 845/186. The North Coast Contesters club boasts three of the best superstations in the country – K3LR, W2FU and K8AZ – and all of them were out in force for the CW weekend of the 2018 ARRL International DX Contest . Unfortunately, conditions were terrible and this really impacted our stations this year, but our guys still put in incredible performances. In many respects each of us operated in a different contest. The several hundred miles between us — especially the north-south distance — has surprisingly strong propagation affects especially as we approach the bottom of the sunspot cycle making it impossible for us to compete on a level playing field. At W3LPL we benefited from longer openings to Europe on every band except 10 meters. That produced 340 more QSOs to Europe and ten common European multipliers on 15 meters that were unavailable to K3LR. K3LR enjoyed better propagation to Japan especially on 20 meters, but their 120 additional contacts to Japan couldn’t make up for our longer openings to Europe. Nice comments from Frank, W3LPL, one of the nicest gentlemen in radio contesting today! Congratulations to both K3LR and W3LPL for fine performances. A few miles up the road to the northeast from K3LR is the W2FU superstation. This year Jeff’s ops entered the multi-single category and seem to have walked away with the top score in the USA and Canada with 3,497 contacts, 455 mults and a claimed score of 4,747,470. Interestingly, Jeff’s crew managed to find 123 mults on 20Meters, only four less than K3LR and two less than W3LPL! Moving in the other direction, Tom Lee’s ops at K8AZ in Cleveland’s eastern suburbs put in a fantastic performance in the M2 category, but just couldn’t keep up with the K1LZ ops 600 miles to the east in Medway, MA. Sporting all new Icom radios and optimized antennas, the ‘AZ ops kept the station on for 48 hours and ended up just short of 3,800 contacts and 466 mults for 5.3 million points. Tom’s guys actually found more mults on 10 meters, but the guys at Krassy’s slick station were almost 1,000 QSOs ahead of Tom’s crew to post a score of 7.2 million points. The same factors mentioned above by W3LPL certainly were at play in the K1LZ-K8AZ contest. Total points so far 21,350,699!!!! Great job guys. If I missed your score please hit up 3830 and email me! NCC and our sister club the Mad River Radio Club fielded three joint teams in the February 2018 CW Sprint and all three managed to make the top ten in the team competition! By comparing the total preliminary scores with the claimed scores, you can get an idea of how much our scores were reduced in the log checking. The answer: not very much! There was only one change in order between the claimed scores and the preliminary scores. In the former, W1NN edged out N8EA by one single point, but the preliminary scores show that after log checking, N8EA ended up ahead of W1NN by 30 points! NO3M and K3LR made the top ten high power list, while K3UA, N8EA and W1NN made the top ten low power list. NO3M and K3LR were also in the total QSO top ten, with NO3M placing second! K8MR operated from the station of K5KG where he produced the high score for FL. W1NN operated remote from Japan. Noteworthy scores were submitted by NA8V (995 contacts), W1NN (888 contacts), K3UA (784 contacts), and KW8N (675 contacts). NA8V’s score was the second highest in the 8th call district, just behind that of N8II in WV. Nice job, Greg. Unfortunately, the NAQP whip, W1NN, failed to put WW3S on a team, or we might have had a little better standing for one of our teams since Jamie had nearly 600 contacts. Apologies to Jamie. The annual K8AZ Open House and NCC meeting took place at Tom’s QTH in Chesterland on January 20. Approximately 25 members were in attendance. The recent sub-zero temps moderated somewhat and visitors were able to enjoy moderate weather for a change. As usual, Tom prepared a great spread of snacks and pizza. One highlight was the attendance of N3RA and K3UA, charter NCC members who usually are not able to attend the K8AZ festivities. back on the air recently to work E31A. check payable to Ray Fallen at my CBA. dollar for dollar to reach the $1,000 contribution amount for the tent. for those who itemize deductions. a letter from NCC would have minimal impact at this time. Plaza. Over 300 tickets for the contest dinner have been sold so far. Contest whips will remain the same as 2017.
the umteenth time and was awarded to Contest Whip W8CAR.